Print a cookbook form, shopping lists, and menu forms for your 5.5"x8.5" household planner. Basic Instructions: Print on both sides of your full sized printer paper. Fold in half, cut along the fold and with a hole puncher, punch the binder holes along the CUT edges. Write the month/year and on the blocks, write the dates. These instructions do not apply to the Monthly Menu Booklet. These files are similar to the Monthly Menu Booklet, however; this menu planner is printed in the same way that most of my 1/2 files are printed - on a full sheet of paper with normal printer settings and then folded and cut in half. The "Menu Planner" set consist of three files. They are pictured and linked below. The Menu Planner can be printed back to back as many times as you need. Alternatively, the Menu Planner Rule with Side Lists can be printed on the back of the Menu Planner - the lists will line up, back to back. And of course the Menu Planner Matching Rule may be printed behind anything or paired with itself. This is just to say that all three files are mix and match. The cookbook is basic blank cookbook pages for your 1/2 sized binder. The shopping lists and menus are meant to be printed back to back. The lists are designed to be cut from the page to take with you when you shop. If printed back to back, one side will have lines and the other side will have blocks. Monthly Menu Booklet - I am going to try this planner for a while and then decide if I will keep it or not. Use to make extra pages for notes. File has four pages, which means that the booklet printer setting may be used. 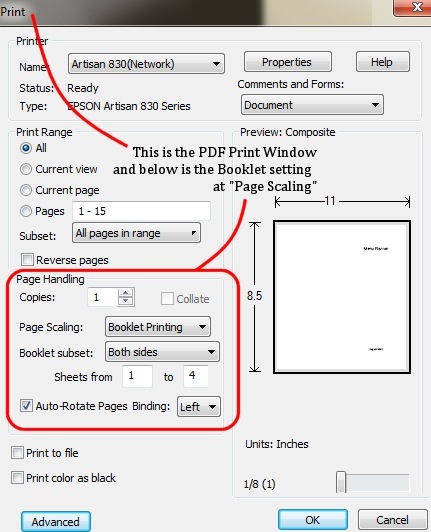 Be certain to set your PDF printer setting to what it was before either after printing the files or the next time you use your printer to print a pdf file.